Olivia and her parents have moved to San Francisco seeking a fresh start after the death of her twin sister Violet. With the family falling apart due to their grief, Olivia is in no condition to get on with her life – until she gets a magic dress that grants a wish, and she’s able to bring her sister back as a ghost. With Violet’s help, can she settle in properly and gain the cute guy she wants? This was simultaneously lighter and more moving than I was expecting. I thought that Violet was a really great character and also was delighted to see a group of rich kids who WEREN’T vile and nasty, especially Calla, Olivia’s rival for skater boy Soren’s affections, who started out seeming like she’d be a typical snobbish girl from one of these books but was actually really likeable and sweet. It’s well written and actually had a plot which had some genuine surprises in it – I realised halfway through the book that I had no idea how everything would be resolved and thought the ending Alexandra Bullen came up with was extremely touching and sweet, especially since Olivia had to decide to try and work some things out WITHOUT using the extra wishes she was given. Recommended to fans of Tera Lynn Childs, Rachel Hawkins and similar authors. The sequel, Wishful Thinking, is out now, I believe. 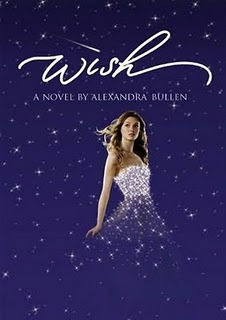 You can get the Kindle edition of Wish FREE here if you're in the UK or here if you're in the US. - Sorry, offer has now ended! Great review! It sounds like such a fun read. And it is great that is for free!